Garlic adds a complex depth and subtle earthy sweetness to the peppery heat for a taste sensation that is just right. Our Garlic Black Pepper Beef Jerky contains a little less cracked pepper than our original Peppered Beef Jerky, and the addition of garlic gives a wonderfully mild flavor our customers love. 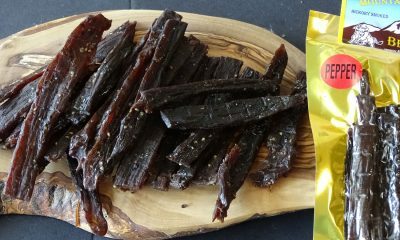 Our beef jerky is made from small herd, locally sourced cows (no feed lot cattle) and is thick cut, marinated, and hickory smoked daily. No MSG, nitrates, or other fillers. 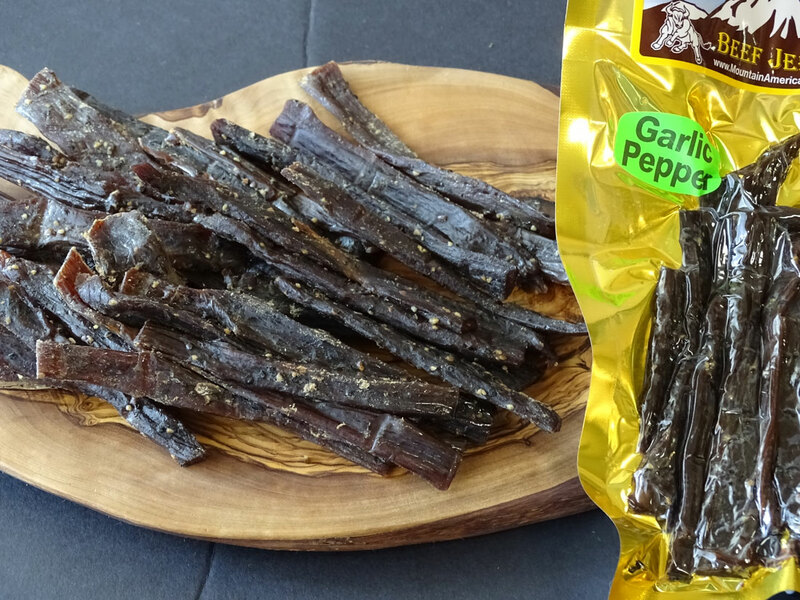 Try some today and discover why the garlic and black pepper flavor combination is a customer favorite. That was my first order and I loved it. I will be telling my friends and ordering again for sure. I’m looking forward to trying out your other delicious products too. This “review” has been a long time coming. It just popped into my head and I didn’t want to wait another minute. Though I should go to sleep. Anyhow, this company is the epitome of things to like about a company. I always buy their product when I am going to the coast, and on my way home, here in Oregon. It’s always the best quality. Sure, you can buy a bunch of high processed 4 dollars a half lb jerky from Walmart. But the truth is, it’s going to be what you pay for. Garbage. 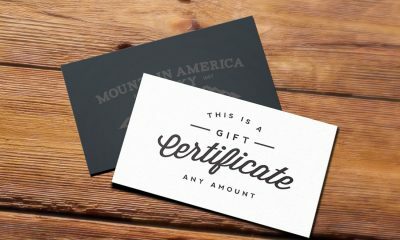 Mountain America is hands down one of the best. I bought some on a return trip from Seaside the weekend of the Superbowl and along with the Garlic Pepper beef, I got some Kangaroo, because who doesn’t want to bring Kangaroo over to a Superbowl party? Anyhow, garlic pepper was for me and wow was it dry. Not normal. Not anything like their typical product. I wrote in to their contact to let the company know that this lot was abnormal, or had been at the store too long, or something. Just for their own QC. The owner wrote me back promptly. Told me that order was a little older than they normally would like it shelved, got my address, sent me a new pouch. That was more than I wanted. I’d still buy a pouch or 3 the next time through. But this gesture was something else. Integrity. Pride in what they do. Now, even though they are based in Colorado and said “Go Broncos” in one of our emails, (I had all sorts of bets on the Panthers that Sunday) I found myself rooting for the team that this great company is based in as well. Thank you guys! Glad you got your win and I look forward to many more stop ins for your products. 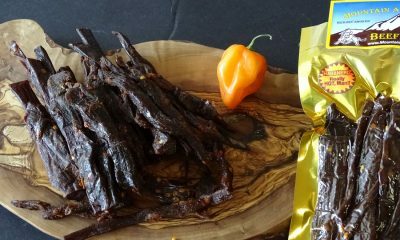 (Garlic Black Pepper Beef review) The jerky tasted very good. I just placed my third order and plan on placing more in the future. My wife and I tried our first piece of Mountain America Jerky yesterday…needless to say that by the time we found the inner strength to close the bag again, it was mostly gone! This stuff is seriously tasty. You can tell that it’s all-natural by the way that it tastes. 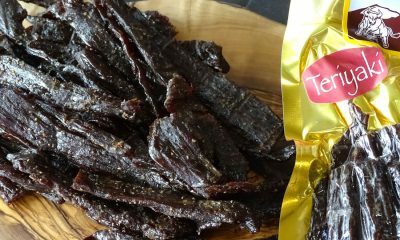 We tried the Garlic Black Pepper Beef Jerky and it is amazing. What a difference from the store-bought garbage! Delicious! I can’t wait to try the rest of the flavors.